This is the first of two reports about premium economy experiences. For longer-haul flying, I am reaching a point where being crammed into economy is painful but business class is unaffordable. The compromise is to pay a bit extra for premium economy which is sometimes quite a good value. In this report, I cover a round trip between Bangkok and Lisbon (returning from Barcelona) on Lufthansa made in October 2016. Lufthansa adjusts the capacity on the Bangkok-Frankfurt route throughout the year to match demand, everything from a 509-seat Airbus A380 to a 251-seat Airbus A340-300, which was used both directions on my trip. The Airbus A340 is a comfortable widebody plane but the type was introduced in 1991 so it is not the latest technology. The normal economy class configuration is 2-4-2. The premium economy cabin, which is located between the business class and economy cabins, has only 28 seats, arranged 2-3-2. These seats are 18″ wide and have between 38-39″ of pitch, the distance from one point on the seat to the same point on the next row. Leg room is quite reasonable although when the person in front of you reclines, you will still find it difficult to get out unless the person in the aisle seat gets up. There are plenty of storage spaces for items and there is a foot rest on the seat in front of you. Bulkhead seats instead have a leg rest that extends from the seat cushion. One feature of these seats is that there are two armrests for each passenger so no fighting for personal space. This is a huge advantage over regular economy. Large touch-screen monitors are available at each seat. The image is bright and the responsiveness of the system is good. The seats are comfortable although a bit firm. After a few hours, I ended up sitting on my pillow to provide extra padding. Recline is quite deep but I still find it difficult to get any meaningful sleep. On the outbound flight, I probably slept about four hours total. On the return flight, less than two. As a comparison, here is a view of economy class mid-flight. You can see the premium economy cabins in the distance, separated only by fabric dividers hanging from the overhead bins. You will notice the monitors in economy are smaller and there is an extra seat in each row resulting in only 17″ width and narrower armrests. Before departure, water or juice is served and menus are distributed. There is no advance meal booking beyond the usual dietary and religious meals. The selection consisted of two main courses. For these flights, each approximately 12 hours, there is a main meal and then a breakfast closer to arrival. After reaching cruising altitude, a drink service commenced. There was a wide selection of beverages and premium economy includes sparkling wine and a premium beer. The outbound dinner was a choice of pork Panaeng curry or pan-seared veal sausages with onion sauce, sauerkraut and mashed potato. I chose the latter. It came with an appetizer of coleslaw with smoked chicken breast and a dessert of apple strudel with vanilla sauce. Before landing in Frankfurt, a breakfast of cheddar cheese omelette with Lyonnaise potato, ratatouille and tomato with fresh fruit was served. There was no other choice. For the flight from Frankfurt back to Bangkok, we had a choice of beef goulash with carrot zucchini stew and potato leek mash (which I chose) or tomato mozzarella fiorelli with basil cream sauce and tomato concasse. The appetizer was a seasonal salad with pumpkin slices and Italian dressing. The dessert was mango pie with creme fraiche. Breakfast before landing in Bangkok was scrambled egg with cheddar cheese accompanied by diced chicken breast, Chinese vegetables (which seemed to be missing) and potato wedges with a dessert of vanilla curd cream with blueberries. Overall, the food quality was good and the quantity was sufficient. The food is served on ceramic dishes with metal cutlery and glass stemware, which creates a nicer impression. 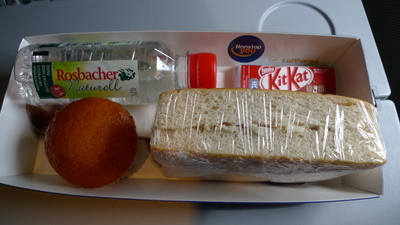 During the flight, light refreshments (sandwiches, fruits, pretzels, candy bars) were available for snacking. Shortly before landing, small chocolates were distributed throughout the cabin. Service from the flight attendants was friendly but efficient. It was notable that effort was made to complete the first meal service quickly, presumably so passengers could go to sleep as both flights are overnight. The inflight entertainment system worked well and has many options. By the return flight, I did feel like I was running out of things that piqued my interest. Thankfully, the seats have USB and power ports, so I was able to pull out my laptop and work and use my iPad to read and watch shows. The system does have a nice maps feature that shows computer-generated views from the tail and the cockpit of the plane. This gives a perspective of what the outside world looks like although it is misleading because the above pictures of our final approach into Frankfurt shows daylight but it was in fact before sunrise. Premium economy does not come with lounge access but as I have “gold” status with one of the Star Alliance carriers, I was eligible to use the lounge. 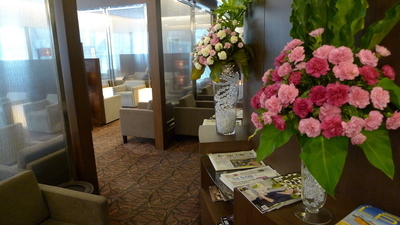 In Bangkok, I was able to use the main THAI Airways lounge. Other lounges closed too early to use as the Lufthansa flight departs after midnight. In Frankfurt, I was able to use the Senator lounges, which are very modern, have a huge selection of food and drink, and offer showers for transiting passengers. I particularly liked the 2-3-2 layout in the plane. The middle seat next to me with empty both ways, giving me even more space. The food was tasty and good quality. And the lounge in Frankfurt was truly refreshing. Connecting through Frankfurt is convenient and results in efficient travel times to Europe from Bangkok. The seat cushions were a bit firm for my tastes (although I find this on a lot of planes), the selection of inflight entertainment was a bit uninspired and Frankfurt is not the most pleasant airport to connect through as it is drab and not particularly intuitive to navigate. I managed to get an attractive price for this flight, only about US$ 1,400 round-trip. The usual premium economy price is closer to US$ 1,800. The extra space and increased comfort made the trip much less taxing and, for the money, was a good value. 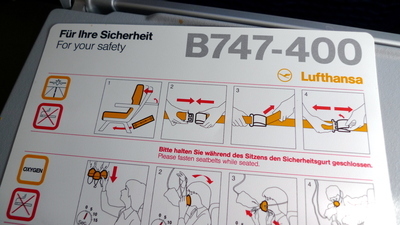 Lufthansa’s premium economy would be worth taking for future trips. Even though the trip was several weeks ago, I’m only now getting to posting my video trip report on YouTube for the trip to Kuala Lumpur. The flight was on Lufthansa, the German airline. They fly it as a tag-on segment to the Frankfurt-Bangkok flight and it is currently the only Boeing 747 being flow between Bangkok and KL. Here is the nine-minute video trip report for your viewing pleasure. Pictures and brief highlights of the flight are provided below. Since I had a mid-afternoon departure and was traveling light, I decided to take the Airport Link train to the airport. Since it opened in the second half of 2010 (blog entry about it here), the service has been a money-loser. Ultimately, it isn’t very convenient and the main in-city terminal is located near a subway station but is not connected to it. (In fairness, they are a month or two away from finally opening an elevated walkway to connect the two.) The system has a notable lack of down-direction escalators, making for a lot of heavy lifting or waiting for the single elevator at each station is you have heavy bags. The State Railways promises to add escalators at key stations but no timetable has been provided. The airport itself is a wonder of glass, steel, and concrete. In many ways, it is hard to distinguish from any other major international airport, although as you can see, some Thai touches have been snuck in. This is a Buddha image that ostensibly contains a relic from the Lord Buddha. 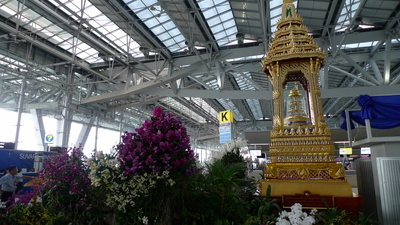 It was set up with a large display of flowers right in the middle of the departures hall as a temporary display sponsored by some company. Hidden upstairs, high above the ticketing counters, is an observation deck. The view is largely obstructed by roof and wall support structures and a scale model of the airport, which has seen better day, is displayed there. Looking closely, I noticed that it had suffered much damage while being moved. It seems a jumbo jet has crash landed on the entrance road to the airport connecting from the expressway! 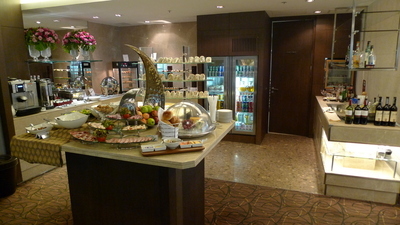 Before the flight, I visited the Singapore Airlines Silver Kris lounge. One of the luxuries I allow myself is a Star Alliance Gold tier membership, which provides me with lounge access when flying Star Alliance carriers. Having a quiet space away from the bustle of the airport makes air travel a lot more enjoyable. This lounge, in particular, is very nice with views of a large garden area. The beverage and food selection surprised me with its breadth. In addition to a variety of cold cuts, cheeses, and desserts, there were several different types of proper food including soups, a salad bar, Chinese steamed dumplings, and a few main courses. I was especially impressed that they had set up a make-your-own “khao chae” bar. 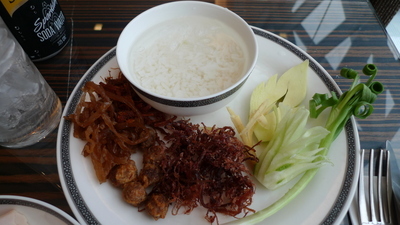 Khao Chae (I wrote about it here last year) is a Thai hot season treat, rice served in cool, fragrant jasmine water with a selection of condiments. Not the type of thing you would expect to find in an airline lounge and something that was not on offer over at the THAI Airways lounge! Kudos to Singapore Airlines for their attention to detail. 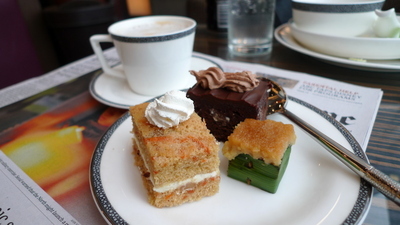 A small selection of desserts, including a traditional Thai dessert cooked in a pandan leaf box, served with a cappuccino. While the desserts were not breathtaking, they were tasty and a wide variety was offered. Our bird as seen through the dirty windows of Suvarnabhumi International Airport. 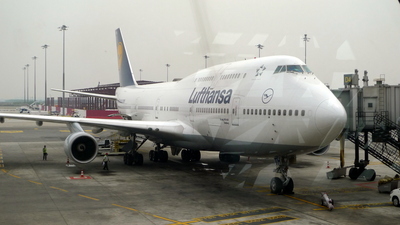 This Boeing 747-400 is nicknamed Duisburg after the famous steel-making city in Germany. It entered the Lufthansa fleet on June 5, 1991 but the interior was in remarkably good shape for a plane quickly approaching its 22nd birthday. Quick review of the safety demonstration card before departure. You can never be too careful, right? If I had to sit in these tight economy class seats for ten or twelve hours, I would not be happy, but for the short flight to KL, it was fine. The seats have large touch-screen monitors playing an extensive selection of films and TV shows. One thing I like about these seats is that the magazines are moved to a pouch behind the tray table, freeing up a little more room for your knees. 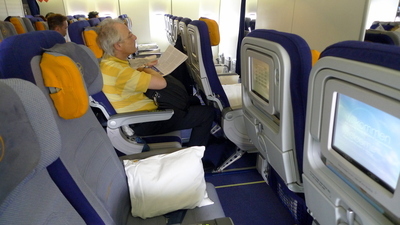 Still, seat pitch was just 31 or 32″, comparable to economy class on most US carriers. Our “meal service” was a snack box with a sandwich that contained the thinnest slice of chicken and the saddest looking leaf of lettuce I have ever seen. A muffin and a KitKat candy bar rounded out the meal. Beverage service was the small bottled water. I think you could go to the galley and request a juice or soft drink but no beverage cart was rolled through the aisles. While it is a short flight, this seems a pretty sad offering for an airline that claims to be full-service. Beginning our descent into Kuala Lumpur on a beautiful late afternoon with high clouds. Closer to the ground, though, the skies were hazy and visibility was limited. Overall, the flight was smooth and reasonably comfortable. The crew, while being pretty senior, was friendly, professional, and seemed to genuinely enjoy working the flight.